AppBridge Blog: AppBridge Signs Partnership with Densan System Co.
AppBridge Signs Partnership with Densan System Co.
AppBridge is excited to announce the signing of a strategic partnership with Densan System Co. in Tokyo, Japan on Wednesday, May 25th. Canada's Minister of International Trade, the Honourable Chrystia Freeland, witnessed and welcomed the signing as a reaffirmation of the growth of technology partnerships between Canada and Japan. 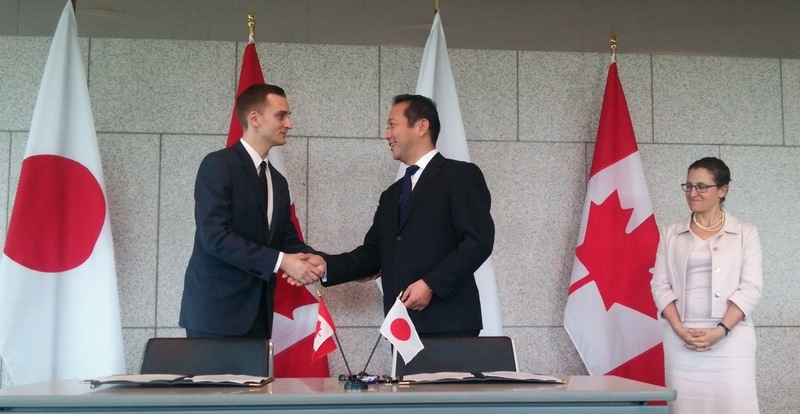 With the signing of this partnership and the support of The Government of Canada's Trade Commissioner Service and CanExport Program, AppBridge projects strong and continuous growth in the Japanese market in 2016. This partnership creates a powerful solution for Japanese enterprises by combining the speed and flexibility of the AppBridge Transformation Suite for Google Apps migration with the world-class services expertise of Densan Systems Co. The Government of Canada’s Trade Commissioner Service provides free advice and other services to Canadian exporters. CanExport provides direct financial support to small and medium-sized enterprises in Canada seeking to develop new export opportunities, particularly in high-growth priority markets and sectors. "Thanks to the Government of Canada support through the CanExport program and partnership with Google Japan, we are now expanding into the Japanese market. This is an exciting and growing space, and we're looking forward to the growth in Canadian hiring this will allow us to pursue. I'm really looking forward to partnering with CanExport again to help us support more Google customers around the world."